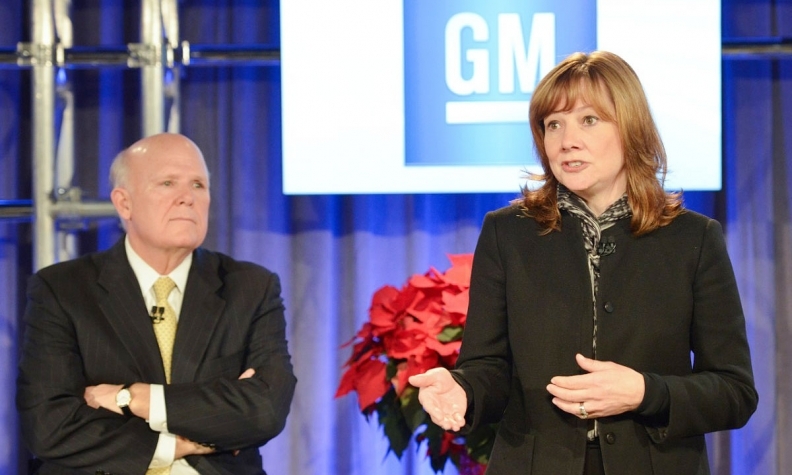 GM CEO Dan Akerson, left, recommended to GM's board that Mary Barra, right, succeed him. DETROIT -- Departing General Motors CEO Dan Akerson says he believes the appointment of Mary Barra as his successor instantly transformed the image of GM into that of a more progressive company. Akerson said during a speech here Wednesday that he recommended to GM's board that Barra succeed him. GM announced her appointment last month. She takes over as CEO next week. Barra, 52, was selected "because of her contributions and solid performance over three decades," Akerson, 65, told an audience of members of the Detroit Athletic Club's Executive Club. As a result of the appointment, he said, "we are viewed so much more differently than our competition." Barra, a GM lifer who has been the company's global product chief for the last three years, will become the first female CEO of a global automaker when she officially takes over on Jan. 15. During his speech, as in other recent appearances, Akerson reflected on his more than three-year tenure as GM's top executive. He said today that he has worked to stamp out the "institutional inertia" of GM's culture, to simplify its notorious bureaucracy and to increase accountability among company leaders and employees. Akerson cited improved vehicle quality, a tightening of fiscal discipline and a reduction in "brand confusion" and complexity as major achievements under his watch. In considering successor candidates, Akerson said he wanted "to continue this revolution, this innovation, this upheaval" under the next CEO's tenure. "About six months to a year ago, it started to really congeal in my mind: What better way to shake up how General Motors is viewed if we can diversify the management of the company?" he said. He noted that women either are the chief decision makers or significantly influence the purchase decisions for two-thirds of the GM vehicles sold. "Just to get people to consider, to look at our product. We're a different company," he said. "I think that was a side benefit. But it is one that I think could make a difference."